Las Vegas, Nev. #143 Police badge, made of sterling silver, hard fired blue enamel, hand engraved. Circa 1949-1973. 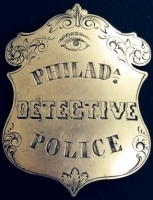 Las Vegas, Nev. #10 Detective Police badge, made of sterling silver with applied 14k gold number, hard fired blue enamel, hand engraved and shadowed lettering. Circa 1949-1973. Hallmarked Irvine & Jachens with Made in America stamp. Las Vegas, Nev. #1 Sergeant Police badge, made of sterling silver with applied 14k gold number, hard fired blue enamel, hand engraved and shadowed lettering. Circa 1949-1973. Hallmarked Irvine & Jachens with Jewelers Union stamp. Very Rare - Nye County Deputy Sheriff badges 24 and 29 of the Mercury Division circa 1951. Mercury is a closed town within the Nevada Test Site populated by employees of the Atomic Energy Commission. In the 1960's the population had grown to over 10,000 residents. 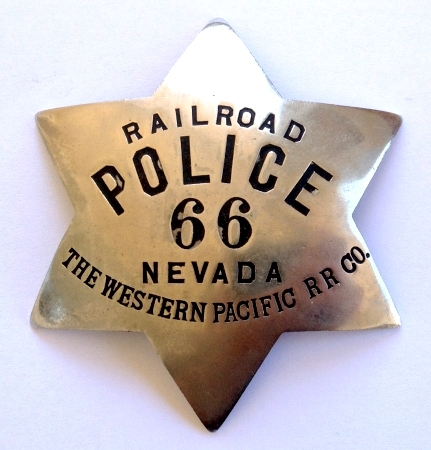 The Western Pacific RR Co. Police badge #66 Nevada. Made by Irvine & Jachens circa 1930. 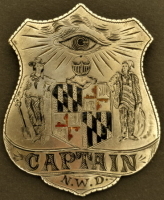 Pyramid Lake Indian Tribe Game Warden badge. Sterling silver, made by Ed Jones & Co. Oakland, CAL. Article from the Los Angeles Times Wed. March 9th 1977 describing Constable Kittie Bonner. Austin Twp. a mining town, is in the middle of Nevada state at an elevation of 7000 ft. Kittie was born in a covered wagon in Oregon and was raised on a ranch in Nevada. She lived in a 13 room adobe house built before the 1900. Reno Patrol Special #502, hallmarked Sterling Irvine & Jachens and dated on the back 4-18-55. Has I J.W U. "bug" stamp. Kitty Bonner Constable Austin Twp. Lander Co. NEV.
Reno Patrol Special Patch. Considered rare. Las Vegas, Nev. #169 Police badge, issued to Ron Oldham who served the department Oct. 30, 1970 to Jan. 1978 when he was appointed a federal Parole Officer. 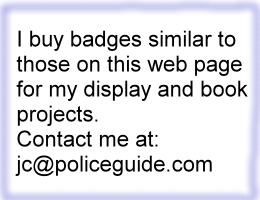 The badge is made of sterling silver, hard fired blue enamel, hand engraved and shadowed lettering. Circa 1949-1973. Hallmarked Irvine & Jachens. Reno Patrol Special Officer Michael L. Grosvenor inspecting a bullet hole in his windshield after a burglar stepped out from concealment and fired on the officer. Grosvenor returned fire and the suspect and another accomplice fled. Photo courtesy of Doug Gist. Nov. 1940 he won the election for Sheriff.